A guest editorial on the balm of poetry in medical and health care contexts, this essay is followed by two poems by the author. It’s often said that only poets appreciate poetry. This spring I had the chance to read some of my poems to an audience of physicians and researchers at Mayo Clinic in Rochester, Minnesota. Imagine reading work about disease to experts who specialize in treating it, to those who are seeking ways to solve the ever-growing prevalence. I’ve been writing about my father’s dementia for the two and a half years it has been apparent. In fact, I’ve been writing about my father for many years before that, as a way to deal with his complicated character. When the Alzheimer’s symptoms became undeniable, I added those to my journal, my language, my coping, my poetry. Dad was living far from his children. That first year — financially uncertain, emotionally exhausting — held such burden and mourning as we tried to get him settled safely. We could no longer ignore what was happening. Daily, I handled details (mostly like a pro, sometimes cursing out banks and other obstacles). Manifesting poems out of the reality provided some comfort. I could move words around, even when I could not save my father from this spiraling path. I could hold compassion. I could grieve. Poetry became my way to collect the beautiful and difficult bits. I built a ritual of writing. The Mayo Clinic Behavioral Health Research Program, Department of Psychiatry and Psychology sponsored my visit to share this work. It was a packed schedule: nine events in four days, including readings and workshops with The University of Minnesota Rochester and the Southeastern Minnesota Poets. But the centerpiece of it all was a talk I gave to Mayo’s research and medical community. The Grand Rounds talk was held in a traditional medical school classroom in the heart of the Mayo Medical School and the Mayo Basic Research labs. It was an honor to stand at that podium and look up toward a full house representing a cross-section of the Mayo community—physicians, researchers, medical students, fellows, and study coordinators. I told them, through poetry, my personal story of endurance and action. The room was so quiet, everyone listening to the little achievements and sufferings of my father and my family. How often do doctors hear information through the emotionally resonant medium of poetry? I gave them that. The talk was intimate; sharing always is. When I was finished, I asked for questions. In the far back corner of the top row, a man in a blue suit (Mayo’s dress code for physician-clinicians) asked what helps caregivers. He asked if poetry helps me. Yes, it helps, I said, then clarified. No, nothing helps, but yes, this is a way through, a way to hold the danger. A caregiver in the audience explained that she is taking care of her father who has Parkinson’s Disease. She said my poems aligned with her experience and gave her comfort. Like mine, her days are made up of a series of crises. Her days are no longer her own. I was asked if my family finds comfort in my poems and if they are supportive of how open I am in my writing, questions I tackled haltingly, because I honestly don’t know. My siblings are proud (and most likely confused) by my choice to write unflinchingly about my life. Someone asked if it felt risky to share. My voice had caught a few times as I read the poems, which surprised me. I told the audience I had nearly wanted to cry. It felt good to come clean about that—though they might have already heard it. As persistent and pervasive and slow-brewing as my father’s disease is, it continually makes me emotional. When you begin a poem, you don’t always know who your audience will be. We write for ourselves, certainly, whether we are exploring a personal issue, a historical event, or something else. But when that writing is shared, it gives another person an alternate way to see and understand. It brings the human level, the individual perspective, and it is there that listeners and readers may locate a different sort of empathy, a sense of belonging. The researchers and physicians in that room spend their work time immersed in the disease and its complications. And though they “treat” the illness, they rarely come in contact with the enduring potency it holds for patient and family. Who treats that? As much I hope for the attention of poet friends and peers, I continue to search for ways to bring my poems into conversation with unexpected audiences. That spring day, still snowy and cold, the doctors were actively engaged in hearing this variation, this response. I felt lucky to bring that forth. To voice this experience, to distinguish one patient, one family from another, and therefore, give credence to all of us. to embrace what is not yet missing. He’ll live to 91.
shaped ear, hear ghosts get off and on at his laments. Published in Knot Magazine. Used with permission. Published in Beloit Poetry Journal. Used with permission. Lauren Camp is the author of three books, including One Hundred Hungers (Tupelo Press), finalist for the Arab American Book Award and winner of the Dorset Prize. 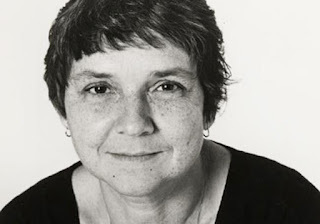 Her poems have appeared in the Academy of American Poets’ Poem-a-Day, Boston Review, The Adroit Journal, Diode, Nashville Review, Beloit Poetry Journal, and elsewhere. A 2018 Visiting Scholar/Poet for the Mayo Clinic (MN) and the recipient of a Black Earth Institute Fellowship, she lives and teaches in New Mexico. Please visit her website. one poet declined, and that with deep regret due to intensifying illness. In lieu of her nourishing presence, Adrienne Rich sent the following statement to the founders. They read it to those gathered at that first festival. It is our honor and pleasure to share it with our community now, ten years on, to inspire us all for the next ten years and the years beyond. Over the weekend preceding “Split This Rock,” I have been watching video clips of the “Winter Soldier” panels conducted by Iraq Veterans Against the War. I have been listening to the hard-earned, factual, understated yet intensely charged words of testimony from these men and women. War and injustice are not “themes” for some poets to pick up or put down by choice. Let’s be clear about this from the outset: Even when we taste the sweetness of life, love, greet a new child, pay decent homage to lost comrades and elders, our work, our access to time and space, our pulse and breath are subject to the structures of inequality, exclusion, cruelty and violence. We read and write poetry to sense through expressive language what the discourse of power has numbed or silenced; to search out truth in our own souls and with other souls. We don’t write poetry to speak truth to power, as if it will change the minds of the powerful. Illegitimate power does not want truth. It depends on manufactured ignorance, manipulation, secrecy and force. We in the United States who have written dissident poetry for much of our lives have done so because, like it or not, politics have saturated the air we breathe, the pores of our skin, the waters we drink, where and how and with whom—and whether—we sleep at night. Recognizing this we crave, and try to create, language equal to our time and needs, our location in a greater humanity. We begin to question easy, cynical formulations and accept the responsibility of our artistic task. Dissident art realizes itself, finds its voice in collective activity. There is no contradiction here, only challenge. May “Split This Rock,” like “Winter Soldier,” become one conversation, one event among the many that, for the long future, must confront our national, our human, emergency.